In nature, rabbits are twilight-grazing prey animals, delicate, gentle, curious, friendly, and non-aggressive. They develop matriarchal social groups and burrow in the ground to build secure nests. Rabbits are exploited on an industrial scale worldwide for meat, as well as for fur, leather, wool, medical research, pharmaceuticals, education, and pet breeding. All domesticated rabbits are derived from the European rabbit (Oryctotagus cuniculus), one of seven divisions in the rabbit family. The most popular strains used in the meat industry are the New Zealand White, Californian, Gray Giant, and Dutch. Special crosses are developed to adapt these strains to local climate conditions. Rabbit meat production schemes have been actively promoted by the Food and Agriculture Organization (FAO) of the UN and by some national breeding associations (France, Italy) for the past 25 years. Their initiatives made extraordinary claims, suggesting that the rabbit factory farming business is a panacea for poverty stricken third-world countries that need to quickly supply cheap sources of healthy protein and employment without adversely affecting the local environment. The FAO advanced the ideas that rabbitries are inexpensive to establish ("low cost of entry") and that rabbits are easy to raise, quick to reproduce, and are an alternative livestock that has a high protein yield ("food security"). In addition, the FAO maintained that rabbit husbandry is an efficient means of converting feed into meat ("resource management") of high quality ("low fat and cholesterol") with a low environmental impact ("sustainable agriculture"). These endorsements also stressed that raising rabbits can provide a nice family hobby while supplementing the family meat supply, and that it is a great learning tool in institutional settings like prisons, long-term care facilities, and schools. With advertising like this aimed at the neediest populations, the FAO encouraged projects in Algeria, Congo, Egypt, Equatorial Guinea, Ethiopia, Ghana, Guinea-Bissau, Haiti, Jordan, Lebanon, Mexico, Morocco, Rwanda, Sao Tome and Principe, and Tunisia. At the same time marketing was also directed at more developed countries like Australia (despite a 25-year ban on raising rabbits for food) and India (with no taste for eating animals like rabbits in their culture). Who benefited: impoverished people or industry boosters? 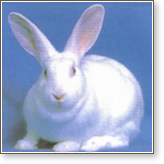 Assessments demonstrated that the rabbit projects were for the most part great failures, that rabbit production requires trained staff, and that rabbits are delicate animals highly susceptible to disease. The project evaluations revealed that rabbit farming is not a quick fix for starvation. It is instead a labor-intensive enterprise that depends on ongoing government support (agricultural research stations providing training and appropriate livestock), good veterinary advice, access to slaughterhouses equipped to service a new industry, and marketing acumen to build a sales network. Well over a million tons of rabbit meat are produced annually, accounting for hundreds of millions of rabbits slaughtered. The largest producers in the world are China, France, Italy, Spain, and several South American countries. Fresh rabbit meat industries have recently been established in Egypt and are developing in India. At fattening stations, all rabbits live in tiered banks of hutches, or crates, made with wooden frames and wire mesh floors and sides — similar to how mink are kept on fur farms and almost identical to the battery system used for chickens. The standard rabbit hutch is 50 cm wide, 50 cm high, and 75 cm deep (18" by 18" by 24"). Some cages have nursing extensions for the babies' first few weeks. A typical farm has a population of 400–1,200 rabbits. Female rabbits (does) start breeding at 4 months and sustain a continuous cycle of overlapping impregnation, gestation, birth, and nursing. The breeding doe is inseminated and gives birth to her first litter a month later. After her first two weeks of nursing, she is bred again and maintains this cycle for three years until she is killed for her second-grade meat. Female breeding rabbits face a high chance of contracting some form of reproductive cancer (ovarian, uterine, mammary). A typical litter consists of 7–8 bunnies who remain in a nesting extension (25 cm, or 12”) of the cage where the mother rabbit is presented for nursing once a day for only a few minutes. The bunnies are weaned after four weeks. Living conditions are designed to produce the most amount of marketable meat in the shortest amount of time at the lowest cost. This amounts to employing restrictive confinement systems, automated methods of daily care, distributed pelleted feed, and no grazing. Commonly a group of littermates are placed together, huddling in a single cage. Their natural instincts and normal social interactions are suppressed in such small crowded wire pens. They suffer from all the same problems as do all industrially raised animals: space deprivation, poor ventilation, manipulated lighting, and consequently they exhibit a range of neurotic behaviors, self-mutilation, and sometimes aggression. Rabbits are highly susceptible to diseases that are often spread through the feed and sometimes during mating. Therefore, good hygiene and preventive care is critical and requires skilled, well-trained staff. The most frequently occurring diseases are bacterial and viral infections like coccidiosis, enteritis (intestinal diseases), and epizootic haemorrhagic disease (contagious viral disease with 80–90% mortality), pasteurellosis (infection with bacteria that cause respiratory diseases), pneumonia, mange, and trichobezoars (hairballs). Mortality rates are high in the young. In addition, viruses sometimes spread quickly in rabbitries and can decimate an entire population on a farm. In some countries like the U.S. and Canada where there are no slaughterhouses that specialize in killing rabbits and butchering the meat, contract arrangements must be made by farmers. Rabbits are selected for slaughter just before they sexually mature when they reach the optimal market weight of 2 kg (4-5 lbs.). The farmers organize a regular transport system, collecting batches of rabbits from individual farms so they can guarantee a steady supply at the abattoir. The rabbits are crushed into crates that are stacked in tiers on open vehicles and then trucked considerable distances. There is no consideration for the animals' stress, fear, or general welfare during these long trips in extreme weather — they are on their way to a brutal factory of death. Rabbits are killed in one of two ways. Usually, the rabbit is held by his rear legs and by the head and stretched out full length. With a hard, sharp pull, the head is bent back and the neck dislocated. Alternatively, the rabbit is hit hard with a blunt instrument behind his ears. Unconscious, the rabbit is hung by a hind leg, his head is cut away, and he is completely bled. Next, his front legs are chopped off and he is skinned and eviscerated, leaving only the liver, kidney, and heart with the carcass. Finally, the rear feet are cut off. In the U.S., rabbits on farms are exempted from regulatory oversight, and at the slaughterhouse the Humane Slaughter Act fails to protect them. Meat safety controls do apply, although regulations vary considerably from state to state. Malta, Italy, and France traditionally have the highest consumption of rabbit meat. In other countries, rabbit meat is promoted by restaurant chefs as a wild-caught delicacy, like pheasant or partridge. The industrial, assembly-line origin is played down. The natural lifespan of a rabbit is 10–13 years, but most factory-farmed rabbits are slaughtered before they are 12 weeks old.